When I was writing my dissertation on the experiences of Asian American musicians playing independent rock music, I discovered that most of the musicians that I connected with spent more time online networking and promoting their music, than actually performing, rehearsing, and recording. This shifted the site of my investigation away from the strictly physical, i.e. in clubs, bars, basement parties, coffee shops where musicians hang out, to include sites of digital social media such as Myspace, Twitter, Facebook, G-chat, etc. In particular, I noticed that Myspace (mid to late 2000s) was a hot spot for social interactions. 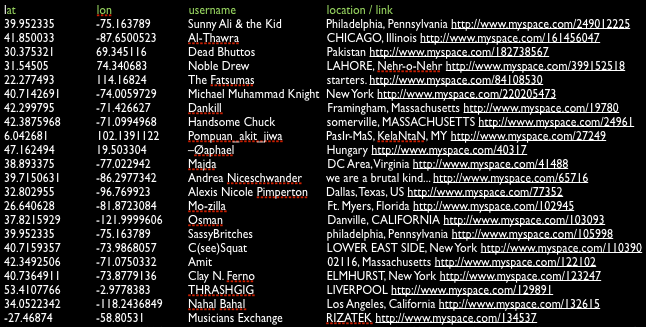 The musicians in my study used Myspace to extend their peer and fan networks beyond the borders of the United States. 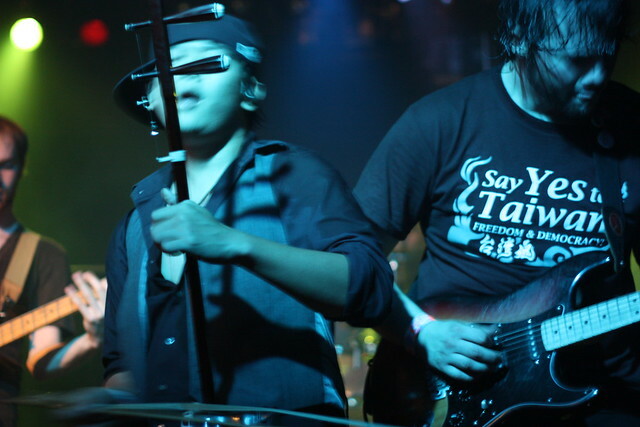 Many of them have forged connections with bands who were geographically based in Asia. I began wondering, what do these online communities look like geographically? Where in the world are the Myspace friends of my musician-informants located? I set out to explore these bands’ digital social terrain beyond what Internet browsers display through leveraging software tools like web-scraping. Web-scraping refers a set of programmatic methods used to extract targeted information from web pages. [i] To extract location information displayed on Myspace profile pages, I created a web-scraper in the form of an Application Programming Interface (API). APIs are, by definition, a set of software components that act as an interface to communication across applications typically based in the web environment (a friendly explanation of API). An example of an API is Twitter client (for example, Tweetbot, Tweetdeck). Instead of using Twitter via Twitter.com, developers have leveraged the robust Twitter API to make available apps for users to interact with Twitter via a computer, tablet, mobile or smart phone. In the case of my API, I had to build it from scratch through writing the commands in the Ruby scripting language. I used the Mechanize ruby gem to navigate the source code of a series of targeted Myspace pages. I will take my work with the South Asian American punk band The Kominas as an example. 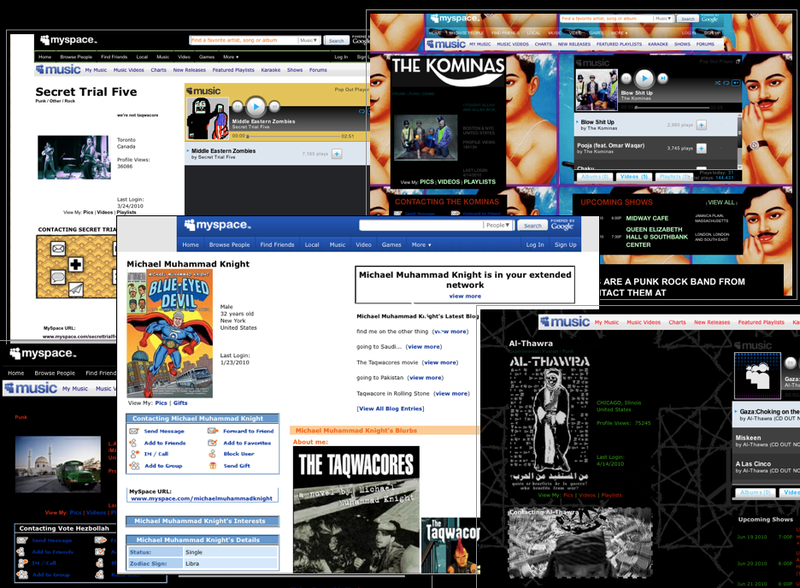 During the period that I was web-scraping, The Kominas had close to 3,000 friends on Myspace. These were all Myspace users who had requested to become friends with The Kominas, or vice versa. My homebrewed API successfully crawled through the profile pages of 2,867 friends of The Kominas on Myspace and parsed the location-specific text in the source code of these pages. Because I planned on mapping these points, I scripted for the API to use the Geokit ruby gem to turn these friend locations into longitude and latitude coordinates. This software tool allowed me to go beyond the textual and discursive dimensions of collecting field data, a path previously unexplored by academic online participant-observers. With the geographical information that I gathered from the API, I mapped out these friend locations. I will go deeper into this in my next post on data interpretation and visualization. But for now, I will say that having this set of data has allowed me to exact my empirical place-based findings in an ostensibly placeless digital environment. Not only that, it has enabled me to deepen my analysis. From these software findings, I generated further questions that are geographically focused and theoretically interesting around notions of space and space. Juxtaposing my findings from traditional (and physical) participant observation and software explorations, I discovered patterns of social behaviors and cultural meanings that I would not have had access to otherwise. With this API, I was able to reach beyond the user- and consumer-end experiences of technology. Using a computational tool — a machine-based script that communicates with other machines — I was able to explore quite literally the software infrastructures in which my field interactions occur. This became apparent when my API broke while trying to scrape location information from the friends of The Hsu-nami, a New-Jersey-based progressive erhu-rock band that I followed, on Myspace China. In troubleshooting, I found that Myspace is in fact not as global as it has promised to be. The Myspace user networks of all (of the available) countries in the world exist on a server located in U.S., with the exception of the users of Myspace China. Hosted on a server in China, Myspace China is positioned institutionally apart from the rest of the Myspace networks in “the world.” These institutional and social barriers are reinforced by the software barriers between Myspace China and Myspace (U.S.) where The Hsu-nami’s profile page is hosted. [ii] From this software “observation”, I have gathered enough evidence to argue that there is not one single cyber space, but rather multiple cyber spaces. The Internet is not one giant blob of space. There are borders and boundaries—software- and hardware-dependent—that bind and separate these cyber spaces. And in the case of the Hsu-nami, forging connections with friends in China potentially suggests that ethnic meanings from musical sound and perform may transcend software barriers. Certain digital communities are more open to software approaches than others. The Myspace community, for instance, is much more closed than Twitter and Facebook. Last.FM, for instance, is built around an open technology that documents each user’s song selection and form a musical taste profile unique to the user. The records of users’ listening patterns are transferred or “scrobbled” to Last.fm’s database. Last.fm make these data available for builders to create APIs; for that reason, it has become a self-proclaimed “social music playground” on which curious programmers and designers to play with (mostly visual) patterns of music listening. One outstanding visualization project that is built upon the Last.fm API is the thesis project of Christopher Adjei and Nils Holland-Cunz. [Here’s a neat video documentation of the application they built]. Unfortunately, none of these studies were ethnographically informed. Their frameworks of analysis are restricted by the domain of software data, and are not integrated with interviews or interaction-based observations. Ethnographers with programming skills – why not? I should also mention that I got into thinking and doing things computationally through the back doors of digital humanities. In grad school, I worked with the awesome folks at the Scholars’ Lab, a hub that trains graduate students in to acquire software skills and digital humanities perspectives at the University of Virginia. At the Scholars’ Lab, under the guidance of humanities-friendly technologists (shoutout to Joe Gilbert! ), I learned basic programming just enough to execute what I had envisioned. Within the community of academic ethnographers, unfortunately, I have not encountered much of any discussion on computational tools like APIs or web extraction. I have seen scholars in computer science, communications, and social sciences apply similar computational methods such as web-crawling in their works. [iii] But I welcome the opportunity of meeting other software-oriented ethnographers or engage in the conversations with those with interests in computational methodology. Everyone’s doing it, why aren’t we? Integrating physical and software field practices has satisfied my thirst as someone who is curious about our contemporary society as it is organized by various digital infrastructures. Zooming back out a bit, it is not hard to see the relevance of web scraping and other forms of web extraction in the media and tech industry. In fact, data-mining is a pervasive practice for acquiring marketing research data. There are bots everywhere. Everyone knows that Amazon stores our browsing patterns and that user information in social media regularly gets mined as marketing research analytics. In light of these pervasive data practices, we as ethnographers should think how we too can leverage these technologies to better understand the infrastructural context, thus closing our knowledge gap between (the cultural and social) content and the (technical and institutional) context of our scrutiny. In my next post, I will talk about how how digital tools could facilitate data interpretation and examination. I’ll focus on mapping as a method to discover and document patterns of place-based observations. Then I will discuss how we can take advantage of the digital capacity to zoom in and out on content so we could deepen our sensory engagement with physical ethnographic materials. [i] The term ‘web-crawling’ is sometimes used synonymously with web-scraping. Typically crawling refers to the technology of extraction all information on the web, similar to the technology of Google search engines. And web-scraping refers to the extraction of specific online information. [ii] The software disconnection between China and the United States (and the rest of the world) on Myspace is maybe a product of the financial and political relationship between the countries. In order to follow up this inquiry, one could search news stories about company structure and changes of Myspace. For more detail, read David Barboza’s article “Murdoch Is Taking MySpace to China”, April 27, 2007. http://www.nytimes.com/2007/04/27/business/worldbusiness/27myspace.html (accessed on January 13, 2011). This is such an awesome, inspiring post! Thanks for sharing, Wendy! Thanks for reading the post, Heather! I would love to hear specific comments if you have any. Here’s a prompt: Would you consider using computational tools for your ethnography? Hey Tricia, Thanks for bringing up your concern about practical limitations. I like your idea about teaming up with programmers. In fact, my project kind of came out of a collaboration. I worked with Joe Gilbert, a technologist with degrees in English and Computer Science, and a love for music (who used to work at a record store!). As a tech mentor, he got me started on the project by giving me a book on Ruby. [most of the book is available online here: http://pine.fm/LearnToProgram/%5D. I went through it, reading and doing the exercises in the book, in a couple of weeks. It got me to the point where I could do really simple programming and begin to understand rudimentary code scripted by others. But I was definitely not coding the API by myself. 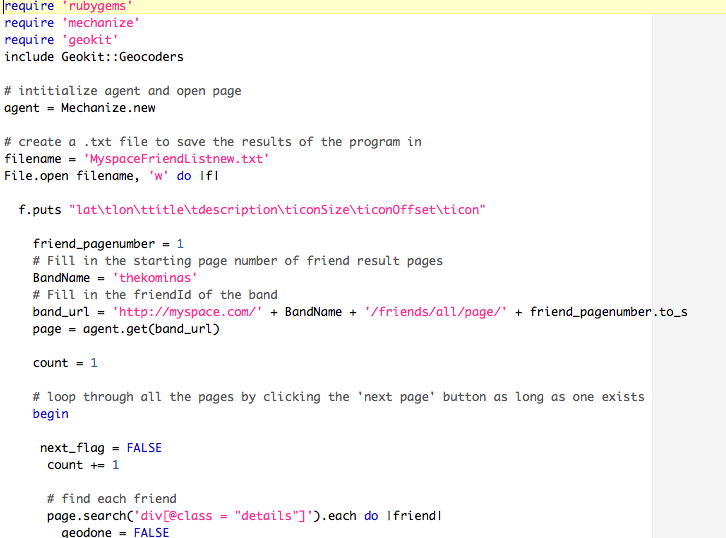 Joe walked me through the steps of creating a script that makes sense for scraping Myspace. The scripting process — testing and refining it — took a little more than a month (10 hours/week). All of this is to say that coding is less daunting than it seems. With a bit of guidance and encouragement, it too can be a skill acquired by non-technologists like most ethnographers. I have been hanging out with digital humanists who do some simple programming themselves. This group of people advocate for a kind of DIY, makers ethos. I agree with them on the power of code, not only as a makers’ tool, but as tool of comprehension. Having a rudimentary understanding of code (like to the extent of having gone through a thin tutorial book) can give us a tremendous insight on how one can more smartly navigate in software environments. But you’re right, we don’t have all the time and luxury to pick up a new skill. It would be cool if ethnographers and programmers have more contact, professional or informal. I bet all kinds of creative products would come out of that. I for one have been thinking a lot about the design of a field app that not only gathers, organizes field data (with meta data), but enables an interaction mode for informants to interact with the device through create their own field documents (stories, pictures, videos, maps, etc). Any programmers out there interested in working with me or others on ethnographic projects? I should really seek out the possibility of working with programming experts to deepen my projects. I’m hoping that through interacting with EM readers, I will eventually find programmer-collaborators to work with. And I am totally willing to share what I know if any of you ethnographers out there is interested in getting started with programming. Drop me a note here or @wendyfhsu. I want to clarify how the technical process of web scraping a bit here. The question about learning curve for web scraping was brought up by Andrew Asher. Depending on the web data that you’re interested in mining and where it lives, one may be able to find simpler, less scripty-solutions packaged as browser plugins or extensions. For instance, for a while, I was using Outwit Hub, a web extraction plugin for FireFox (now available as a standalone program) to scrape performance data listed on Myspace profile pages. There are other pre-packaged solutions out there. I heard from an ethnomusicologist faculty here at Oxy that the Scraper extension for Google Chrome is effective and user-friendly. The Scraper extension exports the scraped data stored in a Google spreadsheet. I should spend some time to explore this tool for sure. I decided to go with a more complex scripted solution because I needed to crawl thousands of pages. And the most efficient way to do this is to utilize the Mechanize Ruby gem. I hope this clarification helps a little, Andrew. And, I still remember that I need to write a more technical post on web scraping (taking one through the scripting process step-by-step, with Ruby and Xpath) later. I will keep you posted! Thanks for posting these resources and more details on how you picked up programming and web scraping. I’m definitely interested if there are are other programmers and ethnographers who are interested in exploring these methods. I’ve also been really interested in the potential of mobile apps for ethnography– especially the potential for doing ethnography at at distance. e.g. If a participant had an app that an ethnographer could push questions out to– something like, “take a film of the event you are at” and then upload to a server for analysis. This would be a really powerful tool for scaling up the amount of data points one person could collect. I’m very interested in applying programmatic methods to data collection and analysis in the context of ethnography. I’m just returning to anthropology to do an MA before my PhD after more or less accidentally becoming a full time software developer (coming from a background of after anthropology and communications rather than comp sci). I’m particularly interested in the quantified self movement, so I’m potentially looking at a ton of quantitative data in several non-standardized formats. This is a great post, Wendy! It’s really inspiring me to think about how I can computation in my own work. Is there a particular reason why you use Ruby, and not, say, Python or Java or something else? Thanks for your question, Calvin. I used Ruby for this particular project because it was (still is?) the scripting language of choice at the Scholars Lab. I have heard that Ruby is a more “human” language and that its syntax is less mathematical and more intuitive for new programmers. I always think about Wayne Graham’s (@wayne_graham) post whenever this “Why Ruby?” question comes up. Wayne compares Ruby to PHP though he doesn’t discuss Python and Java. While Wayne’s post is written for people who are already familiar with programming, especially for the parts on rails, I still think that it’s a good place to learn about Ruby. At the end of the post, he provides a number of helpful resources for learning Ruby. I don’t entirely get the technical depth of Wayne’s post, but I do find his discussion about learning curve useful. In particular, he illuminates the importance of learning a language that is used and supported by the people in your immediate social circle, physical or virtual. I, for instance, have been thinking about picking up Python because there is a local women-only Python group (PyLadies) that gathers informally in the LA metropolitan area. He recognizes that the choice of one’s first scripting language is important, but also notes that once you start to get the gist of it, it is not too hard to translate what you know from one into the other. Hope this helps, Calvin. And definitely let me know if you’re up for meeting to geek out on Ruby since you are in the LA area! Thanks for sharing this wonderful post with me. It’s inspiring on many levels: DIY programming exploration, collaboration (Scholars Lab is such a great model for other universities), the way in which your ethnographic research turned to issues of space, how your research revealed in a concrete way the infrastructure of the Internet and its relationship to politics and economics at a global level. That’s just a few things I noticed. That’s a great zinger of an observation. 1 – Does this kind of digital ethnographic work have a particular relationship to understanding questions of “space” ethnographically, materially, materially, politically. Could you imagine other lines of inquiry that web scraping might might help to develop (time? aesthetics? race? gender? class? ethnicity? the very question of digital experience, what it is and how it relates to other aspects of life?) or do you think there’s something particularly important about digital research and issues of space? 2 – How might you intertwine your “traditional” modes of ethnography with your digital research? Sounds like you might address this in an upcoming post! 3 – I’m interested in your use of the word “leverage.” What do you mean by this word exactly. It comes from the business world, yes? How are you adapting it to your scholarship? (ok, I am playing language police a bit here, guilty as charged, but I really mean to ask about what drew you to that word. It’s an interesting kind of crossover move to take it from business world and apply it to your use of digital in ethnographic research). 4 – Finally, what would Alan Lomax think?! Thanks again for sharing this with me. Can’t wait to read the next installments!